I recently saw a semi-truck pulling an empty trailer. 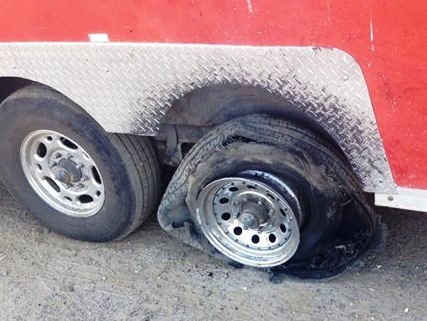 I noticed that two of the tires on the trailer had blown out. However, the other tires on the trailer were more than able to carry the weight. The trucker was not stranded. He was able to make it in for the needed repairs. This reminds us of how we all need to pull together. Sometimes we go through a rough stretch, and we feel like a tire that’s blown out. That’s when we need to count on others to carry the load for us. As we all pull together, we will not be stranded on the side of life’s highway; we will eventually make it to our destination. “Carry each other’s burdens, and in this way you will fulfill the law of Christ.”—Galatians 6:2. This entry was posted in Christian Living, Church, Leadership, Prayer and tagged bear one another's burdens, body of Christ, flat tire, Galatians 6:2, illustration, tire blown out. Bookmark the permalink. You’re welcome and God Bless!